We provide clients with marketing tools that fit specific objectives. We don’t think you should buy promotional products without a plan. In fact, we don’t believe you should buy ANY type of advertising without knowing the result that you expect to receive. We DO believe in the power of well-planned, well-executed promotions that have specific objectives. When effectively designed, a promotion can provide more “bang for your buck” than any other type of advertising. Lucky for us, many marketing firms don’t understand the difference between a give-away and a promotion… or how to design a successful promotion. 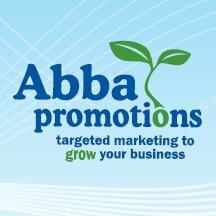 ABBA PROMOTIONS provides marketing products and services to clients throughout the country. We’ve worked with over 58 political campaigns and many non-profits. Clients have ranged from small businesses to Fortune 500 companies such as Tyson Foods, Bristol Myers, and ClearChannel Radio. You can buy t-shirts and coffee mugs from almost anyone… but it takes a skilled marketing professional to help you plan a promotion designed to meet your specific marketing objectives within your budget and time-frame. If you are a regular customer of Abba Promotions, then you already know the value of having a close relationship with a marketing professional. If you’re not… we can’t wait to show you.